Nearly four centuries ago, in The Country Parson, His Character, and Rule of Holy Life, George Herbert imagined the rural pastor as a shepherd, standing on a hill, considering his flock during those brief moments when he wasn’t actively serving them. It’s an apt image. Throughout his famous guide to rural ministry, Herbert urges country pastors to consider their particular place and people, to “carry their eyes ever open, and fix them on their charge” rather than on professional advancement. Before writing the book, Herbert himself had left behind high-profile positions as the public orator of Cambridge University and a member of Parliament to become the priest of a small, rural parish 75 miles from London, where he served (humbly and well, by all accounts) for the remainder of his short life. Underlying Herbert’s Country Parson is his conviction that there is dignity and value in rural ministry, that while ministry in small places has plenty of attendant difficulties, such a calling is worth a lifetime of care and devotion. It’s a view found in a variety of later writings, including J. C. Ryle’s biographical sketches of the 17th-century English rural ministers William Grimshaw and John Berridge (1885), and fictional works such as Georges Bernanos’s The Diary of a Country Priest (1936), Bo Giertz’s The Hammer of God (1941) [article], Conrad Richter’s A Simple Honorable Man (1962), and Marilynne Robinson’s Gilead (2004). And it’s a view that has fallen on hard times in 21st-century American Christian culture. The finest seminary graduates are usually expected to go to the cities, and many aspiring pastors don’t even consider the possibility of a long-term call to a small place (though they may see it as a stepping stone to something better). Of course, as Wendell Berry has rightly said, “Not all ministers should be country ministers, just as not all people should be country people.” But if you believe—as Berry and I do—that some ministers should be highly trained, fully committed, long-term country ministers, then the loss of Herbert’s vision of rural ministry as a high and worthy calling, not merely a second-best option, is a great tragedy. If Herbert’s vision is to live on and capture the hearts of some in a new generation, it will likely be, in part, through the work of gifted writers. Brad Roth’s recent God’s Country (2017) provides a biblically informed, culturally aware, and deeply compelling understanding of rural ministry. There are also biographical stories that capture the beauty and brokenness of those who live in small places (e.g., Rod Dreher’s The Little Way of Ruthie Leming) and the hardship, joy, and dignity of long-term ministry among them (e.g., D. A. Carson’s Memoirs of an Ordinary Pastor). But there’s also an important place for continuing the tradition of compelling fictional accounts of rural life and ministry. Though Berry, more than any other recent writer, has opened a window into the complexities and possibilities of rural life through his Port William novels, he has never presented a compelling fictional vision of rural ministry (perhaps because, by his own account, he has never known a pastor to stay long-term). Marilynne Robinson is the contemporary novelist who has most richly imagined and incarnated the modern country parson. Her fictional Iowa pastor John Ames is one who stayed, and preached, and loved his people, rather than leaving. His life and ministry express the dignity and value of a long-term pastoral call to a small place. Winn Collier has now provided, in the person of Jonas McAnn, another compelling fictional rural pastor (one who claims that John Ames may be his favorite fictional clergy!). 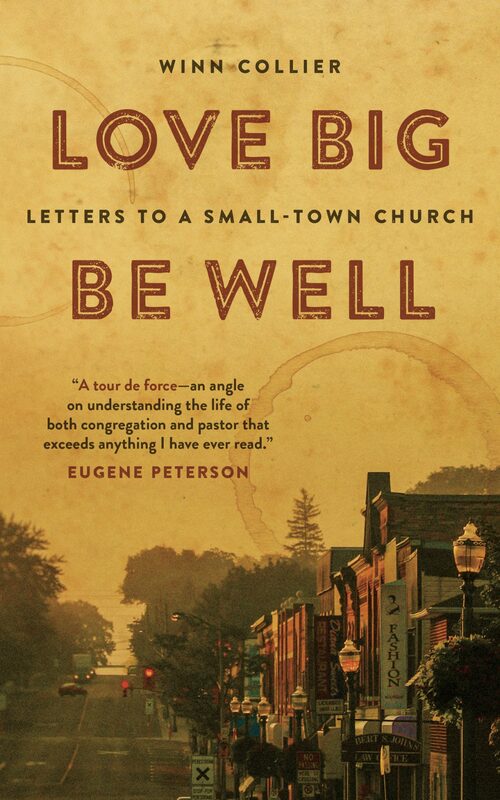 Love Big, Be Well: Letters to a Small-Town Church is an epistolary novel consisting of 32 letters, most of them written by McAnn to his small-town congregation in Granby, Virginia, over the course of seven years (2008 to 2015). The letters begin near the time of his first contact with the pastoral search committee and extend to his farewell on the eve of an imminent sabbatical. They probe the nature of love, friendship, church life, and Christian ministry, particularly the possibilities and perils of small-town life and ministry. In fact, the committed friendship required by life and community and ministry in a small place will enlarge the hearts of those willing to give and receive it. “A sign of an authentic encounter with love is this: we are made larger” (54). It turns out small places can be particularly good at encouraging and promoting deep love. Eerdmans (2017). 166 pp. $16.99. When Granby’s pastoral search committee and Jonas connect through handwritten letters passed back and forth, something sparks between them. Part of loving people is embracing the place where they live. In response to the self-deprecating comments of some parishioners regarding their small-town ways, McAnn writes that “to belong to this church means to belong to this place. It will take time, but we’d like to make a life here, if you’ll have us” (18). And McAnn exhorts his church: “We need an actual community devoted to our home, to Granby. We need a community of friends who take on responsibility for Granby, who will suffer alongside it and refuse to lose hope in it” (27). Genuine love will see this not as a second-best path of life and ministry, but as an immense privilege. And genuine love will be directed and tailored to the particular people it lives among: “I want to preach sermons that would only fit in Granby. I want to live a life that wouldn’t make much sense anywhere else but Granby” (135). Genuine love will keep on “showing up” in friendship, no matter what. Herbert insisted that the distinguishing mark of a country pastor ought to be his love for others, and that the great “business and aim” of the country pastor is to stir up love among the members of his flock. One of the most important reminders of Love Big, Be Well is that the reality and depth of our committed, persevering love for one another is what’s most important, not the size of our church or city (or the rapid growth of our numbers). In a Christian culture that often embraces the celebrity status of famous pastors, we need to hear McAnn’s commitment to preaching to people “with a name”—real people he knows and lives with and serves and loves. In a Christian culture that often privileges the big places, we need to hear McAnn’s conviction that serving his particular people in his particular (small) place “is work worthy of a life” (44). Love Big, Be Well isn’t a perfect book. It occasionally gets in its own way through over-writing and cliché, provocative but undeveloped points (e.g., McCann’s cursory explanation of why he asks the saints in heaven to pray for him), and its curiously recurring references to expletives, which come across as self-conscious and forced (a bit like the printed coffee cup stains on the pages of the book). At some points, McAnn’s letters miss important opportunities to be genuinely helpful by remaining too vague and avoiding specifics. This is particularly the case in his attempts to navigate the important tension between commitment to truth and loving others. Because he stays at the level of generalities rather than wading into the complexities of a particular issue requiring discernment, the discussion never touches down to fruitful specificity. Our God and King, who called your servant George Herbert from the pursuit of worldly honors to be a pastor of souls, a poet, and a priest in your temple: Give unto us the grace, we pray, joyfully to perform the tasks you give us to do, knowing that nothing is menial or common that is done for your sake; through Jesus Christ our Lord, who lives and reigns with you and the Holy Spirit, one God, for ever and ever. Stephen Witmer (PhD, University of Cambridge) is pastor of Pepperell Christian Fellowship in Pepperell, Massachusetts. He teaches New Testament at Gordon-Conwell Theological Seminary and helps lead Small Town Summits, which partners with The Gospel Coalition New England to serve rural churches and pastors. He is author of Eternity Changes Everything: How to Live Now in the Light of Your Future (The Good Book Company, 2014) and the volume on Revelation in Crossway’s Knowing the Bible series. You can follow him on Twitter.